Sadly, the Horse and Dolphin pub, where slave turned pugilist Bill Richmond was landlord for several years, is no longer in existence and the building which once housed it is also no more. (Click here for the full story behind Richmond and the Horse and Dolphin). However, there is still a pub in central London with a significant link to Richmond's incredible life and, indeed, an indelible link to the world of Georgian pugilism as a whole - namely Shepherd Neame's Tom Cribb pub on Panton Street, just off Leicester Square. Until 1960, the Tom Cribb was known as the Union Arms - so named in celebration of the Act of Union in 1707 between England and Scotland. In the early 19th century the pub's landlord was Richmond's great rival, the eponymous Cribb , who was one of the greatest pugilists of the Georgian age and reigned as English Champion from 1808 until his retirement in 1821. 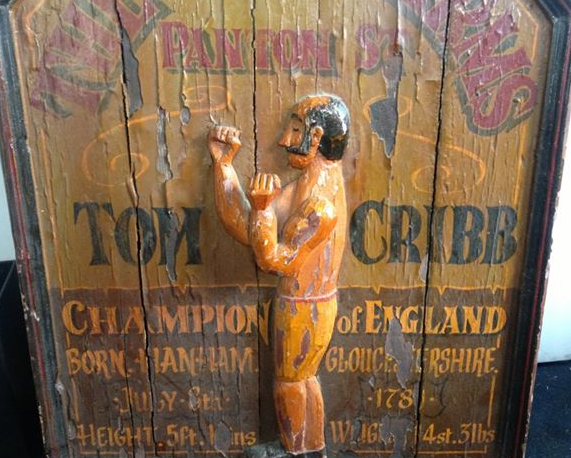 Cribb defeated both Richmond and his protégé Tom Molineaux during a glorious career, although he was inactive for a whole decade of his reign, failing to fight a single competitive contest after his second victory against Molineaux in 1811. Exactly when Cribb assumed the position as the Union Arms' landlord is unclear, although it was certainly after the second Molineaux contest and before 1818, when Pierce Egan recounted in Boxiana that he had stepped back from boxing in order to "serve his customers in a more palatable style". Prior to taking the reins at the Union Arms, Cribb had also, according to Egan, served for short periods as the landlord of the Golden Lion pub in Borough and the King's Arms in Duke Street, St James's. "The Sun Fire Office records of 1821 shows he purchased The Union Arms, Panton Street, for £950. A fair amount in those days. This figure included 'Household Goods', Wearing Apparel, Printed Books and Plate. Stock, Utensils, and Goods in trust add another £500 to the purchase, plus a further £50 for 'China and Glass' ... In 1822, the Sun Fire records reveal that the value of the Union Arms and its contents had risen to a total of £1,800." Located just off the Haymarket and close to Soho and Leicester Square, under Cribb's aegis the Union Arms soon became a favoured haunt of 'the Fancy', the varied members of high and low society who followed pugilism and other pleasurable sporting pursuits. 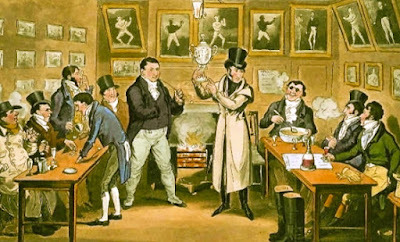 In Pierce Egan's influential 1821 masterpiece Life in London, 'Cribb's Parlour' was immortalised in Cruikshank's illustration (see top of this page), which indicates that boxing prints were a fixture on the pub's walls, including two which look like they are of Richmond and Molineaux. "Behind the bar of this hostelry there was a green baize door which opened into a large, red-papered parlour, adorned by many sporting prints and by the numerous cups and belts which were the treasured trophies of the famous prize-fighter's victorious career. In this snuggery it was the custom of the Corinthians of the day to assemble in order to discuss, over Tom Cribb's excellent wines, the matches of the past, to await the news of the present, and to arrange new ones for the future. Hither also came his brother pugilists, especially such as were in poverty or distress, for the Champion's generosity was proverbial, and no man of his own trade was ever turned from his door if cheering words or a full meal could mend his condition." Another famous resident of the Union Arms was Cribb's dog Billy, a canine of "rat killing celebrity" who was said to have slaughtered upwards of 10,000 rodents in his life, as well as winning every single dog fight he participated in. How many of these acts of violence were committed at the Union Arms is unclear. 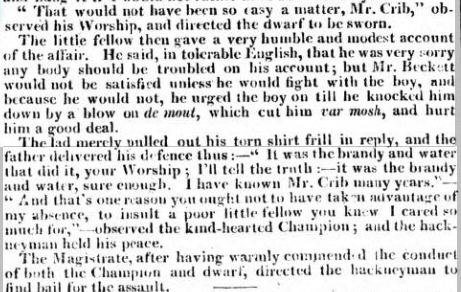 However, after his death aged 14 in 1829, which was widely reported in the press, Cribb had Billy stuffed and he resided thereafter on the counter of the pub! 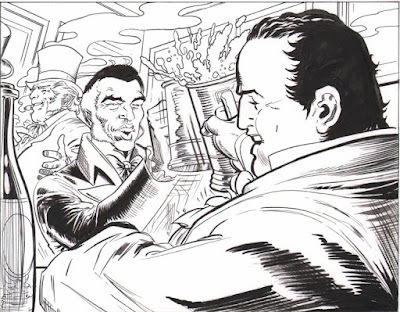 During Bill Richmond's later days, when he faced considerable financial challenges, he often met and conversed with Cribb at the Union Arms, helping mend their previously fractious relationship and rivalry. Indeed, the two men became such close friends that it was soon their custom to dine together at the Union Arms on Sunday evenings. It was after one of these meals, on Sunday 27 December 1829, that Richmond returned home before falling ill with a coughing fit and then dying in the early hours of Monday morning. 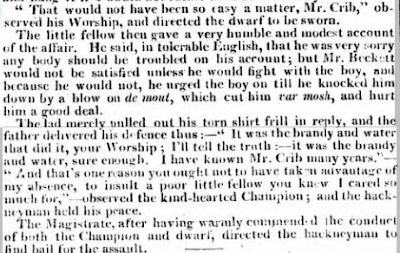 After Richmond's death, a heartbroken Cribb wrote an extravagant eulogy in Richmond's honour, based on Mark Antony's tribute to Caesar in Shakespeare's Julius Caesar. Interestingly, Cribb pointed out that although Richmond had been free to "sluice his gob for nothing" in the Union Arms he had always proudly insisted on paying his way. Sadly, Cribb's 'oration' was never delivered in person - the former champion missing Richmond's funeral because of a serious incidence of gout. 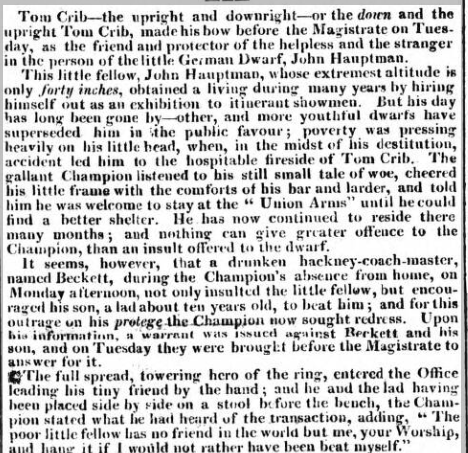 As the 1830s advanced and pugilism's popularity declined, Cribb faced increasing financial troubles. Sometime towards the end of the decade, Cribb had to give up the Union Arms, probably around 1839 when Hurley claims he moved to live with his son and daughter-in-law in Woolwich. It was here that the great pugilist died in 1848. As shown by the research on pubshistory.com, the Union Arms has continued to trade ever since Cribb's death. Although it is thought that the building was substantially rebuilt in 1878, it remains on the same site as in Cribb's day, namely "the corner of Panton Street and Oxendon Street" as described in Bell's Life in London in 1821. Changes in numbering on the street account for the fact that the pub is now 'no. 36' rather than 'no. 26' as it was in Cribb's time. In 1960, the pub was renamed in Cribb's honour, and today, owned as it is by Shepherd Neame, Britain's oldest brewer, it is a delightful old-fashioned central London boozer, which celebrates its boxing heritage not only through its name and the pub sign, which features a likeness of Cribb, but also with an English Heritage plaque in Cribb's honour and numerous boxing prints on the walls. Where is the old Union Arms sign kept? I would love to see it in person.